As a homeowner, I’m used to getting all sorts of shady offers in the mail for new mortgages with astoundingly bad terms. But now that home values are declining, the free market has spawned a new kind of scam, at least in California. In our fair state, home values are reassessed only when they are sold (hoo boy, Prop 13!). In the meantime, the County Assessor assumes that your home value increases by about 2% each year and increases your property taxes accordingly. Historically, this has been a win for homeowners, whose property value was outpacing 2% by leaps and bounds, and a increasingly problematic loss for any local tax-supported services (such as school funding). Anyway, these new offers take the form of a letter warning you that your home is probably worth less than the county thinks it is, and giving you the opportunity to pay a third party company to file a “tax reassessment” form to have the property properly revalued (and get a lower property tax bill). What makes this such a miserable scam is that anyone can file this form themselves, for free. Here are online instructions, with the online form. Not only that, but the County Assessor is pre-emptively re-assessing 500,000 homes this year (sold between 2003 and 2008) to see if they should be adjusted — you don’t even have to file the form! The County Assessor’s office is clearly exasperated with this scam, too, and has posted a scam warning on the subject. Recently, I received one of these offers that really took the cake. Not only did the letter from “Property Tax Adjustment Services” try to entice me to pay for a free service, but it actually came formatted as a bill — complete with a “due date” and a “late charge” if payment was not received by the deadline! 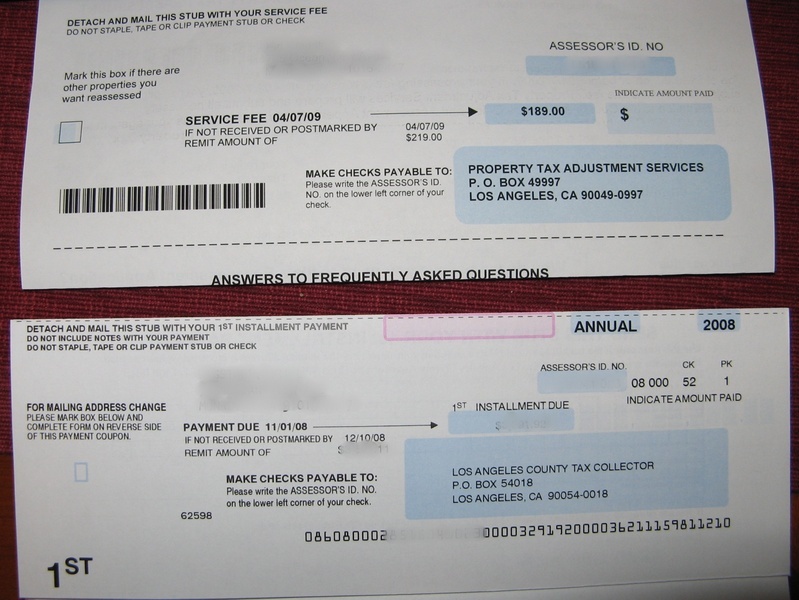 As I stared at the “bill”, it seemed strangely familiar… so familiar that I went and dug up my actual property tax bill. They are formatted virtually identically. See image at right (click to enlarge). The “reassessment bill” is on top, and my property tax bill is on the bottom (actual numbers removed). Obviously they’re hoping that I as a busy homeowner might glance at this and think it comes from the County Assessor’s office and is a required payment. This scam letter actually does mention the fact that you can file the form yourself (but not that it’s free to do so). It also warns that “Property Tax Adjustment Services” is an expert business who will ensure that it gets done right. Yeah. The form requires all of three pieces of information: your home’s address and the addresses of two comparable recent sales. This information is available easily from the County Assessor’s website, which even has a browsable map interface so you can see all recent sales near your home. Disgusting, is what it is. Or simple capitalism in action? Caveat emptor! Gah. I wonder what junk mail is floating around in New Mexico. I get very similar scams for both of my businesses. Corporations (of any sort) are required to hold board meetings once a year, and keep a formal agenda in a record book, with the names of all officers present. Also, they are required to file an information statement (address, phone number, etc) with the state each year, at a cost of $25. There’s a private organization calling itself “California Corporate Compliance Board” that will generate said agenda and print out the form for you, for something like $150. Similarly, they will file your information statement for you for also abut $150. In both cases, they send a formal-looking letter to the company notifying you of the due date and making it look like you owe *them*. If you look very carefully there’s always fine print somewhere saying “this is not a government document”, but it’s so convincingly done that I’ve twice gotten about halfway done with their paperwork before catching myself. I wouldn’t be shocked if this is the same outfit running your reassessment scam. Disgusting? Definitely. It must be a very profitable venture for them that the county has notices placed throughout their site telling people it’s a scam. I frequently receive official-looking domain renewal notices from the likes of “Domain Registry of America” (and others) whose goal is to switch my domain hosting (as opposed to web site hosting) to their much more expensive service. (It’s very amusing to receive postal mail addressed to “Spammers must die” or “Washington State Resident.”) My dad just got one of these, but before sending it in, thought to ask about it. Not many people do. Not really a scam, but also worth being wary of is the auto-renewal. In a previous contract I had, the vendor made a third of its revenue from people who signed up for the service with auto-billing, but never used the service.